A general summary of the weather pattern leading to multiple chances of rain Wednesday through Saturday. The brighter skies won't last long. Upper-level winds out of the west are still quite strong, and this will keep weather systems marching across the nation about every other day for at least the next week. Clouds were already noted on satellite streaming in from the southwest early Tuesday, associated with the first of at least three disturbances slated to move through the Southeast over the next seven days. Moisture will be limited with the first system, so widespread rain is not expected Tuesday or Wednesday. However, a few showers will be possible in the low country Wednesday as the system exits. A stronger storm system will quickly move across the Palmetto State Thursday, when a period of heavier rain and possible thunderstorms are expected. 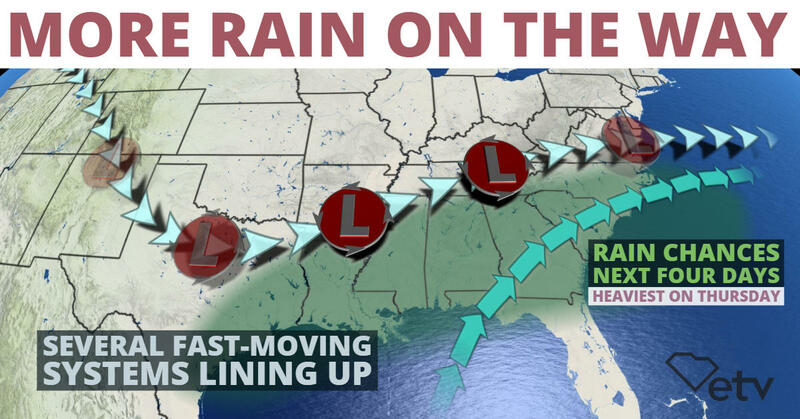 The heaviest rain with this system is likely to fall from the Midlands to the Atlantic Coast. Another storm system, with a stronger cold front attached, is projected to move through South Carolina this weekend. Multiple rounds of rain will be possible Saturday and/or Sunday, followed by a notable drop in temperature. This could potentially set the stage for a wintry mix of precipitation in the Upstate early next week as yet another disturbance heads our way.